Udaipur is famously called the city of lakes because of the man-made lakes connected mostly connected with each other. There are five lakes including Lake Pichola and several historical monuments including Jag Mandir Palace and more in Rajasthan’s sixth largest city. Maharana Udai Singh founded this romantic city way back in the mid-1500s. Famously called the ‘Jewel of Mewar’ the city was constructed on the banks of the beautiful Lake Pichola. Udaipur is the main destination in the Palace of Wheels 7N/ 8D luxury sojourn. Enjoy basic facilities in sheer luxury on this week-long tour with interesting activities on the itinerary like camel ride, jeep safari, breakfast, lunch or dinner in premium hotels and off-board guided tours. Guests on the Palace on Wheels journey enjoy sightseeing and interesting activities in this city with so many lakes & palaces. The Palace on Wheels itinerary is structured to give time for activities including shopping around in the local markets of Udaipur. 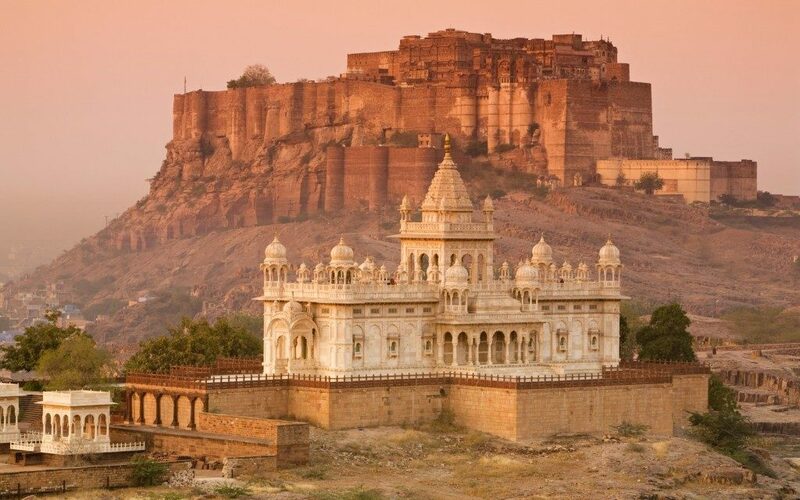 This city was a former capital of the Mewar Kingdom for many centuries until the British rule. There is an interesting story behind this great city. The King was on a walk when he met a holy man who told him to build a city. He advised the ruler to build the city within the mountain ranges of the Aravallis and he did. This city is now one of the most sought-after tourist destinations in North Western India. On the fourth day of the week-long luxury sojourn, the guests of the Palace on Wheels arrive in the picturesque city of lakes Udaipur. Guests de-board to have a reviving breakfast at a premium deluxe hotel in the morning before starting the sightseeing. The guests are taken on off-board sightseeing excursions with English speaking guides. For some tours, special kits are provided or they are available in the A/C Coaches to travel to the destination. This includes mineral water, hats, shoe accessories, etc. However, it is advisable for guests to wear comfortable clothing and footwear. After a lengthy and tiring morning sightseeing trip in Udaipur guests have lunch at a heritage hotel in a stately manner. Then, they can get an exciting boat ride on the famous Lake Pichola before returning to the air-conditioned coaches of Palace on Wheels train. The guest carriages comprise of fully air-conditioned super deluxe cabins (2) & 39 deluxe cabins with single, double and suite occupancies. Guests can enjoy facilities like safety locker, en-suite washrooms, a dedicated attendant for each carriage, Wi-Fi internet, LCD display with satellite channels, twin or queen-size beds, and a large window with a panoramic view. Common facilities include gym & spa, mini bar & lounge and DVD players too. Guests can chat with each other in the resting lounge, read a magazine/ newspaper, play a board game or sip an electric drink from the bar, etc. While traveling to the next destination – Jaisalmer, guests have refreshing hot beverages like tea with refreshments in the evening. Have a sumptuous dinner onboard the Palace on Wheels in any of the two lavish dining cars. Guests can taste continental, European and traditional (Rajasthani) cuisine here. The ‘Maharajah’ and ‘Maharani’ restaurants have two & four seating arrangements besides the window for a great passing view. Book your tickets to explore the city of Lakes through Palace on Wheels train to enjoy a great holiday week. Copyright © 2019 Travel Tips. All rights reserved.